One of the first things I tend to gravitate towards while reading magazines are the gift guides, no matter the publication. They bring an extra bit of fun to the holiday issues that can’t be found in the issues put out at any other time of year. Not only are gift guides entertaining, they are also helpful and practical. Even when I know exactly what I’m getting everyone, gift guides always spark new ideas in my head. These days, instead of scouring magazines, I've been hopping on the internet to get my fix of variously priced gift ideas. Because of that, it’s safe to say that my gift list highly exceeds my budget this year. Oops. If you enjoy gift guides like I do, I hope to bring some gift-giving inspiration to you with a gift guide of my own. 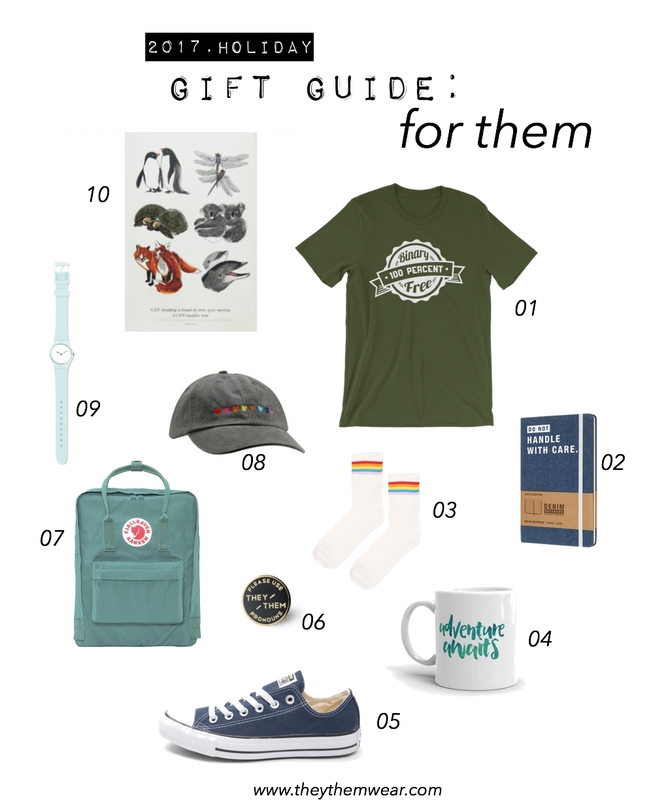 Naturally, I’m adding a little non-binary twist to mine, as I share 10 gift ideas for the non-binary or gender non-conforming people in your life. Most of these ideas work for LGBTQ+ people in general, or for those who just like super cool stuff. Cool t-shirts are always a nice gift, so why not give one that let's them show a little pride in who they are. Not only that, but it shows that you support them and respect their gender identity. This design is also really unique and sharp. Along with the green, this tee also comes in red. I always appreciate a good, quality notebook- probably because I'm always thinking up ideas that I need to write down. This notebook by the one-and-only Moleskine is bound in denim which looks very retro and durable. Imagine sticking some 90's patches on the front. It reminds me of making purses out of jean pockets as a kid. Socks. I feel like you either love getting them as gifts or hate them. For those sock loving peeps in your life, you can't go wrong with some rainbow tube socks. With their subtle design, they can fit into any colorful wardrobe. They also give me slight "Juno" vibes. Mugs are another go-to gift that are easy to find. This one features a handmade watercolor design, and its purchase directly supports an artist. Converse are such a solid, staple shoe, fitting into so many wardrobes and worn by people of any age, style and gender. I've owned my fair share of these bad boys. I even got a pair last Christmas that I wear on the daily. Another handmade gift idea is this super rad pin! I am personally a little bit in love with it. It gives me vintage camp vibes, and 100% of its profits are donated to Camp Aranu'tiq, a nonprofit program serving transgender & gender-variant youth and their families. You can't go wrong there. Like the Converse, Kankens are so versatile as far as their audience goes. Yes, they're a little bit mainstream hipster, but you can't deny that they are cute (and practical) as heck. They come in a huge range of colors, so you can find the perfect one for your enby friend! With its cute, simple design, I can't help but love this "Love is Love" cap. The hat comes in three colors and features adorable rainbow hearts. Plus, it's by HRC, a company that supports and fights for LGBTQ+ people's rights. Watches are something that I previously overlooked. I mean, who needs a watch when you constantly have your phone nearby? Well, if the watch is this cute, then I definitely need it. Making this gift guide has renewed my love of watches. I need one now. My own gift guide convinced me that I need this. Finally, we have this simple animal poster. But wait. It's gay! The illustrations are so lovely, and the company is a nonprofit organization that promotes LGBTQ+ equality and visibility. That concludes my first annual holiday gift guide! 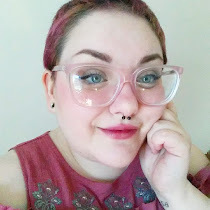 I hope I could offer some inspo and ideas for the LGBTQ+ people on your list, in particular your non-binary friends! This was a ton of fun to put together, and I feel good about including a couple non-profits and good causes in there. It is, after all, the season of giving. Let me know which item is your favorite in the comments, and happy shopping!